The Auto Parts retail industry is a $58B industry, which has historically experienced single digit growth year over year. Online auto part sales in 2017 accounted for $8.89 billion of this revenue in 2017, posting a 16% increase over 2016. The top market share is led by AutoZone, Advance Auto Parts and O’Reilly Auto Parts. The industry has low barriers of entry, few restrictive regulations, and easily trainable workforce. Despite low barriers, high levels of competition exist making it difficult for new operators to succeed. The market is attractive with consistent growth over the years as more vehicles continue to age and car owners are keeping their vehicles vs. purchasing new. Brick and mortar auto part retailers have been traditionally focused on two types of customer: “Do it Yourself” (DIY) and “Do it For Me” (DIFM Professional Providers). The top three companies have had competitive advantages from the threat of disruptive online retailers primarily through relationship networks with professional DIFM providers, and efficiencies with fully scaled nationwide same-day delivery. This segment has been able to capitalize on larger profits on auto parts by up-selling different warranties on store aftermarket parts. Over the years, stores have had consistent growth, however last year reported flat earnings. The DIY segment is the most vulnerable for retailers. Nearly three-quarters of AutoZone’s revenue comes from do it yourself clients. Advance Auto Parts and O’Reilly Auto Parts have no more than half of their revenue exposed to this segment. Amazon has been targeting this market with an aggressive pricing strategy with prices 22% lower than these retailers. They have also started rolling out same-day delivery in several major cities. Long term, Amazon has the ability and capital to get closer to customers and expand into the traditional retail customer sector as it navigates to solve quick on-time parts delivery. AutoZone operates 6,023 stores, across 49 states. Total revenues $11,010.0 (MM), +2.7% total revenue growth and employs 87,000. Cap rates for AutoZone increased 23 basis points in 2017 to 5.79%. In 2017, the company opened 168 stores in the U.S and added 15 net stores in Q1 2018. AutoZone owns approximately 48% of its stores and in recent years has moved from build-to-suit leases to ground leases and land purchases. Advance Auto Parts operates 5,230 stores in 49 states. Total revenues $9,419.77(MM), -1.07 total revenue growth and employs 74,000. 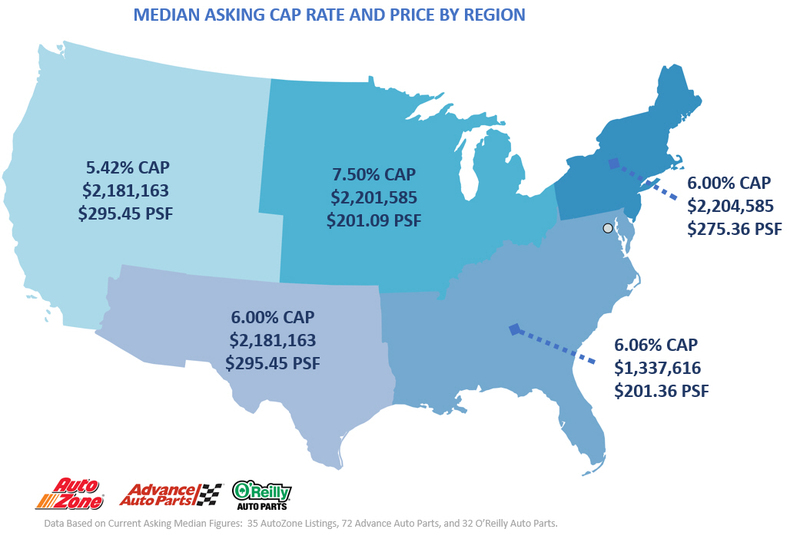 Cap rates for Advance Auto Parts decreased 2 basis points in 2017 to 6.64%. Advance Auto Parts leases 4,373 locations and opened 47 new stores in the first three quarters of 2017, closed 18 and consolidated 15 stores. It also converted 132 Carquest stores to Advance Auto Parts stores. New stores range from 6,000 SF – 8,500 SF. O’Reilly Auto Parts operates 5,019 stores across 47 states with total revenues $8,593.1 (MM), +7.9% total revenue growth and employs 74,715. Cap rates for O’Reilly Auto Parts increased 7 basis points in 2017 to 5.93%. O’Reilly Auto Parts opened 198 stores and closed 8 stores in 2017. O’Reilly Auto Parts owns 1,912 stores and leased 2,842.